In a significant development, the government today announced lifting of ban on mobile telecom services in the North East and Jammu and Kashmir, and said state-owned Bharat Sanchar Nigam would roll out its mobile services in every district in the North East region by August 15, 2003. The Congress today stepped up campaign for the removal of Communications Minister Pramod Mahajan, who has been accused of involvement in the Shivani murder case, by holding a demonstration in front of his residence here. Taking serious note of “back-dated transfer” of 75 junior engineers by the Jammu and Kashmir Government ahead of the Assembly poll there, the Election Commission has directed it to forthwith rescind their transfer. JKLF Chairman Yasin Malik was today discharged from All-India Institute of Medical Sciences following improvement in his health. “Malik has been discharged from AIIMS...We were not allowed to meet him,” amalgam sources said here. Most probably he will be shifted to a Jammu jail tomorrow, the sources added. Prime Minister Atal Behari Vajpayee has called a Cabinet meeting tomorrow morning to discuss the implications of the Election Commission’s order, rejecting the Gujarat Government’s request for early Assembly elections in the state. The meeting would start at the PM’s Race Course residence at 11.30 a.m., a PMO spokesman said. 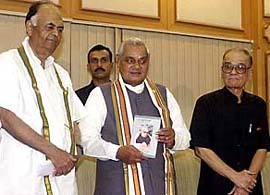 Prime Minister Atal Behari Vajpayee releases a book of his poems in Tamil Presentation of Vajpayee 31 at a function in New Delhi on Saturday. Also seen in the picture are Deputy Chairman of Planning Commission K. C. Pant (left) and translator of the book and member of the Planning Commission Venkata Subramaniam. Hailing the decision of the Election Commission not to go ahead with the Gujarat elections as “the people have lost faith in the state administration” the Samajwadi Party, at its state executive meeting held today, said after such a harsh stricture passed by the EC, the Deputy Prime Minister, Mr L.K. Advani, has lost moral right to continue in office. The CPM today hailed the Election Commission’s decision to hold elections in Gujarat only in November-December, saying that the “nefarious” moves of the BJP to force immediate elections in the state had been “thoroughly exposed. Indefinite curfew was clamped in Dhoraji town of this district after eight persons were injured, four of them seriously, in a clash between traders of two different communities. Trinamool Congress supremo Mamata Banerjee called on Prime Minister Atal Behari Vajpayee and Vice-President-elect Bhairon Singh Shekhawat in what was described as courtesy visits before returning to Kolkata today. Another accused in the Coomar Narain spying case, V.K. Palaniswamy, has approached the Delhi High Court against the trial court’s order sentencing him to 10 years’ rigorous imprisonment under provisions of the Indian Penal Code and the Official Secrets Act. With the plantation of cotton crop in north-western Rajasthan falling to an all-time low, a question mark has arisen over the fate of farmers in the region, who are already in dire straits for the past few years due to a continuous decline in the yield of the “white gold”. In a major relief to new petrol station allottees here, the Nagpur Bench of the Bombay High Court has stayed the Centre’s decision to cancel allotment of petroleum, kerosene and LPG dealerships granted since 2000. The CPM today demanded a thorough inquiry into the reported land deal of BJP chief Venkaiah Naidu and his family members, besides steps to cancel the irregular allocations. Alert has been sounded in some rural areas of Meerut especially in the areas falling under the Lawar police post following the hoisting of the Pakistani flag on a Madarsa building in Basala village on the Independence Day. The Yamuna river in spate due to a breach in the Yamunanagar dam in Haryana. The river waters flood the low-lying areas of Delhi. The Kolkata High Court concludes arguments in an appeal for release filed by Peter Bleach, a British citizen serving life sentence in an illegal arms drop. Art critics acclaim paintings of a severely ill young boy, displayed in Bangalore, to fund his medical treatment. “Cabinet Committee on Security has decided to lift the ban on mobile telecom services in North East and also in Jammu and Kashmir,” Union Communication and IT minister Pramod Mahajan said while dedicating Rs 242 crore Community Information Centre project to the North East here. “The telecom revolution was halted in the North East due to security clearances, now this roadblock has been cleared by the CCS,” Mr Mahajan added. The minister further said that in order to take telephone at the doorstep of every citizen in the country, the government would start a pilot project “Mobile Postman” in 2000 post offices covering 10,000 villages across various states from December 25 this year. “The postman who comes to you to deliver post will come with a Wireless in Local Loop (WLL) telephone. The phone would have a display screen - and we are talking to LG to make that handset - which will show the bill,” Mr Mahajan said, adding that the postman would get 20 per cent commission on the bill while the postal department would get 5 per cent. The “Mobile Postman” project would be rolled out to every village depending on the results of the pilot project, he said, adding that in a year’s time, scheme of mobile PCO would also be taken up. “In BSNL, we have linesmen. And with everything going wireless, these linesmen would be used to use mobile PCO,” he pointed out. The CIC project in 487 block headquarters in seven North Eastern states and Sikkim is aimed at promoting application of IT for accelerating socio-economic development of the region. The Commission has also directed the state government to stay the transfer of 23 tehsildars, carried out by it without the clearance of the commission, sources said here today. In its order communicated to the government yesterday, the commission asked it to maintain status quo ante regarding the transfer of all these officials, the sources said. The model code of conduct, which bars transfer of officials without the EC’s approval, had come into effect from August 2 the day the poll schedule for the four-phase elections were announced. On August 14, the EC	had sought immediate replacement of Mr Ejaz Iqbal, Deputy Commissioner posted at Poonch, due to his failure to implement its directions. Meanwhile, the full Election Commission will begin a three-day tour to Jammu and Kashmir tomorrow for an on-the-spot assessment of the preparations for the forthcoming poll beginning on September 16. The commission, consisting of Chief Election Commissioner J.M. 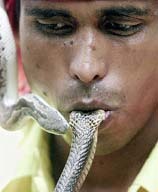 Lyngdoh and Election Commissioners T.S. Krishnamurthy and B.B. Tandon, will meet senior state administration officials, representatives of political parties and non-governmental organisations during its visit to Srinagar and Jammu. JKLF Chairman Yasin Malik was today discharged from All-India Institute of Medical Sciences (AIIMS) following improvement in his health. “Malik has been discharged from AIIMS...We were not allowed to meet him,” amalgam sources said here. Most probably he will be shifted to a Jammu jail tomorrow, the sources added. The senior Hurriyat leader was admitted to AIIMS last week after his condition deteriorated in Jammu’s Kot Bhalawal jail. The JKLF chief was re-arrested under the Public Safety Act within minutes of his release in a case under POTA on July 20. The police said he was arrested for his “anti-national activities”. A special POTA court presided over by P. N. Razdan had released the JKLF chief on health grounds and on a surety of Rs 1,00,000. In a surprise action, a large number of party workers, mostly women, assembled at Indira Gandhi memorial on Safdarjung Road near the residence of Mr Mahajan and after taking oath to fight for social justice and equality, stormed the police barricade, demanding Mr Mahajan’s dismissal. Mrs Ambika Soni and Mr Ahmed Patel, political secretaries of Congress President Sonia Gandhi, AICC General Secretaries Oscar Fernandes and Mukul Wasnik, Mahila Congress chief Chandresh Kumari and DPCC President Subhash Chopra were among those who took part in the protest. Displaying banners and placards, the activists also demanded that Mr Ananth Kumar, Mr Ram Naik, Mr George Fernandes, Mr Yashwant Sinha and Mr Pramod Mahajan, allegedly involved in various scams and scandals, should resign or be dismissed. The demonstrators also accused Prime Minister Atal Behari Vajpayee for his failure to stop corruption at higher levels. Prime Minister Atal Behari Vajpayee has called a Cabinet meeting tomorrow morning to discuss the implications of the Election Commission’s (EC) order, rejecting the Gujarat Government’s request for early Assembly elections in the state. The meeting would start at the PM’s Race Course residence at 11.30 a.m., a PMO spokesman said. Deputy Prime Minister L.K. Advani met Mr Vajpayee this evening to discuss the future course of action. Earlier today, the BJP charged the EC with creating a “constitutional crisis” by refusing to order Assembly elections in Gujarat before October. It also indicated that it was keeping its options open to take legal recourse. The Congress on the other hand has demanded that caretaker Chief Minister Narendra Modi step down and Gujarat be brought under President’s rule. Hailing the decision of the Election Commission (EC) not to go ahead with the Gujarat elections as “the people have lost faith in the state administration” the Samajwadi Party, at its state executive meeting held today, said after such a harsh stricture passed by the EC, the Deputy Prime Minister, Mr L.K. Advani, has lost moral right to continue in office. “The Deputy Prime Minister should resign immediately,” the president of the SP, Mr Mulayam Singh Yadav, said. The two-day state executive meeting that ended today passed a special resolution on Gujarat in which it praised the decision of the EC not to hasten the Assembly elections. In the light of the observations made by the EC the party also requested the President to sack the Gujarat Chief Minister, Mr Narendra Modi, so that the situation could be brought back to normal. Addressing mediapersons, Mr Yadav alleged that he had report that the BJP wanted to create a Gujarat-like situation in the country. Talking about Uttar Pradesh he said: “There are two ministers of the BSP cadre who have broken all previous records of fleecing people of the state,” he said. The party urged the President to constitute an inquiry committee, headed by a sitting high court judge, who could probe into the assets of the ministers and top bureaucrats of the state. Mr Yadav also alleged that the Mayawati-led BSP government was harassing SP workers and arresting them on false charges. The nefarious moves of the BJP such as non-holding of the assembly session in time, premature dissolution of the Gujarat Assembly and blatant attack against the Election Commission were all meant to force an immediate election in Gujarat,” the party Politbureau said in a statement here. It said the commission rejected the assertion of the BJP that the situation in Gujarat was quite normal and conducive to holding free-and-fair elections after an assessment of the ground realities in the state. “The EC’s observations that the law and order situation in the state is ‘still far from normal’ and that the ‘wounds of communal divide following the riots have yet not healed’ has vindicated the party’s stand on the issue,” the CPM Politbureau said in a statement here. The EC came to this conclusion after a report from a nine-member team sent by it and thereafter verified by a visit by the full EC panel to Gujarat, the Left Party said. This has exposed the BJP’s “diabolical and dangerous move” to take advantage of the communal divide and win elections, the party said. In another statement, the CPI(M-L) said it was the duty of the Central Government to act on the decisions taken by the EC. The party also demanded the dismissal of the Narendra Modi government and imposition of President’s rule in the state. According to the police, the trouble broke out over a petty issue, but it soon turned into a ‘free for all’. Worried shopkeepers closed their shops as miscreants went on a rampage. The police, however, did not provide details about the incident which sparked off the violence. According to eyewitnesses, lethal weapons were freely used in the clash. District Collector Anita Karval and Additional Collector Pankaj Raval and DSP V.M. Parghi rushed to the town to take stock of the situation. The curfew was imposed as a precautionary measure from 3 pm. The seriously injured were rushed to the Civil Hospital at Junagadh, while others were being treated locally, police sources said. Ms Banerjee visited Mr Vajpayee at his residence here last evening. Sources said no issues, including the bifurcation of the Eastern Railway, were discussed during the meeting which lasted about 15 minutes. She, however, submitted a copy of the resolution unanimously adopted by the partly working committee on its relations with the NDA. According to the resolution, the party had declared that it could not be part of the NDA until and unless the government reviewed its decision on the bifurcation issue. During her meeting with Mr Shekhawat today, she expressed happiness on behalf of her party on his election. She had stayed away from voting in the vice-presidential election on August 12 and staged a dharna, failing to wrest any firm commitment from Mr Vajpayee on his personal intervention in the bifurcation issue. Another accused in the Coomar Narain spying case, V.K. Palaniswamy, has approached the Delhi High Court against the trial court’s order sentencing him to 10 years’ rigorous imprisonment (RI) under provisions of the Indian Penal Code and the Official Secrets Act. A Division Bench comprising Mr Justice Dalveer Bhandari and Mr Justice R.S. Sodhi would hear his plea on Monday. The petition, which initially came up before Mr Justice M.A. Khan, was sent to the Division Bench as it had on August 8, admitted an appeal filed by Yogesh T. Maneklal, the main accused in the case and issued a notice, returnable on August 21, to the prosecution. On July 16 Special Judge R.K. Guaba had found 13 persons and S.L. Maneklal Industries Limited guilty of supplying classified military and financial documents to foreign agents in 1985. On July 18 he sentenced Maneklal to 14 years’ RI and the other 12 accused to 10 years each for indulging in espionage. In his petition filed through counsel Sidhartha Luthra, Palaniswamy alleged that the Special Judge had appraised the evidence selectively and not applied his mind to the evidence produced and proved in the case. Maneklal had claimed that the trial court did not appreciate the fact that there was not a single incriminating circumstance against the appellant to justify the conviction, but it held that he was at the centrestage of the espionage network set up by Coomar Narain for the benefit of the company. This finding was not based on any legally admissible evidence but on presumptions and inferences not justified in law, he said in a petition. The judge also erred in convicting the appellant on the basis of the confessional statement of the deceased (Coomar Narain) using it as substantive evidence, whereas in law a confession could only be used to lend assurance to nearly conclusive or substantive evidence available on record. Apart from the confessional statement, no other witness who was examined, had implicated him in obtaining or communicating any confidential document, the petition said. Severe drought conditions in Rajasthan and inadequate supply of canal water have resulted in farmers drastically cutting down on sowing cotton this year, even though there is little scope for alternative crops. The Sriganganagar circle, which comprises Sriganganagar and Hanumangarh districts, was earlier known for its high yield of cotton. “Only 40 per cent of the cultivable area has been sown as compared to last year,” the District Collector, Mr Ram Avtar Raghuvanshi told TNS. Pointing out that the basic reason for an extremely low level of plantation was a poor monsoon, he added that if the region still did not receive rain, then even this might produce low yield. The government would conduct a girdawari (survey of loss) from August 16 to 21 for identifying the drought-hit areas and assessing the loss to the farmers. While the state of cotton crop in the pockets around Sriganganagar and Hanumangarh towns is reasonably good as compared to other parts of the region, areas around Suratgarh and Anupgarh are particularly hard-hit. Local residents say that 14 villages around Suratgarh are drought-prone while areas around Garhsangh have received no rain. In areas around Anupgarh, farmers say that only about 10 per cent of the land has been cultivated this year despite the fact that this is among the few pockets where ground water is suitable for irrigation. “The earnings of farmers in this area have been plummeting.” said Mr Harvinder Singh, a farmer in Sarasar village. “Till about five years ago, a farmer with a land holding of about 25 bighas could earn Rs 75,000-80,000 in a season. Today, whatever little he earns is negated by expenses,” he added. Local traders estimate a yield of about 4 lakh bales in the Sriganganagar Circle this year. Last year’s estimate had been 10 lakh bales though the crop was destroyed by storms at the time of reaping and only about 3.82 lakh bales were produced. There has been a significant decline in guwar (fodder) also. While about 10 lakh tonnes of guwar was produced in 1999-2000, only about 4.5 lakh tonnes was produced last year. This year’s produce, too, depends on the rain. The price of guwar has risen from Rs 900 per quintal to Rs 1,450 per quintal, adversely affecting the livestock. The alternative to growing cotton in the region is growing moong and moath, but here, too, availability of water is the crucial factor. According to available reports, the region has received only 50-60 mm rain compared to 285 mm last year. Further, the ground water in large areas is unfit for irrigation due to high salinity. Sriganganagar is the only region where three canals — the Gang, Indira Gandhi and Bhakra canals — besides the Ghaggar flow through it. Despite this water is scarce. Sources say that only about 700 cusecs of water was being made available to this region during the sowing period whereas the requirement was 2,000 cusecs. It was only a few days ago that the water supply was raised between 1,300-1,700 cusecs. The Gang canal has unpaved embankments and the authorities fear that the banks may be damaged if the flow of water is increased. The Bench, comprising Mr Justice R.G. 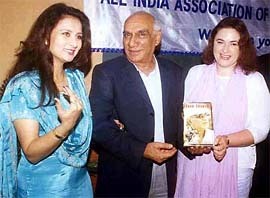 Deshpande and Mr Justice P.S. Bramhe, in an interim order, yesterday asked the public sector oil companies not to give effect to the cancellation orders and directed the companies to restore the possession of agencies to the petitioners before the Court. The Bench, while issuing notices to respondents, the Union Petroleum Ministry and three PSUs, Indian Oil Corporation Ltd (IOC), Hindusthan Petroleum Corporation Ltd (HPCL) and Bharat Petroleum Corporation Ltd (BPCL), asked them to submit their contentions on oath on September 11. The judges made it clear that the 18 petitioners, whose plea was heard by the court, were free to run their agencies till the next date of hearing but should maintain a separate account as directed by the court. “The Andhra Pradesh Government should conduct an immediate inquiry into the whole affair and take steps to cancel the irregular allocations,” the CPM politburo said in a statement here. The statement said according to reports, “D” form pattas obtained by him and his family members were issued as per government rules only to the poor and downtrodden sections of society and not to persons who owned any piece of land in their own names. A Hyderabad news daily had reported yesterday that in 1978, Mr Naidu, his father-in-law Alluru Mastanaiah, his brother-in-law Alluru Bhaskar and other relatives had come into possession of about 40.15 acres, which had been earmarked for landless poor. Police sources told The Tribune on telephone today that the Pakistani flag was hoisted by a crowd of over 200 students of the Madarsa who had also taken out a procession and raised pro-Pakistan and pro-Osama-bin-Laden slogans. The incident created communal tension in the village under the non-Muslim population objected to it. Only about a week ago two ISI agents owing allegiance to the Al-Qaida were arrested in Saharanpur who had plans to create disturbance on the Independence Day. The police sources said students were led by three maulvis who were teaching in the Madarsa. The maulvis Mohammad Ishar, Hafaz Muhhamad Umar and Rukmudden have been arrested.